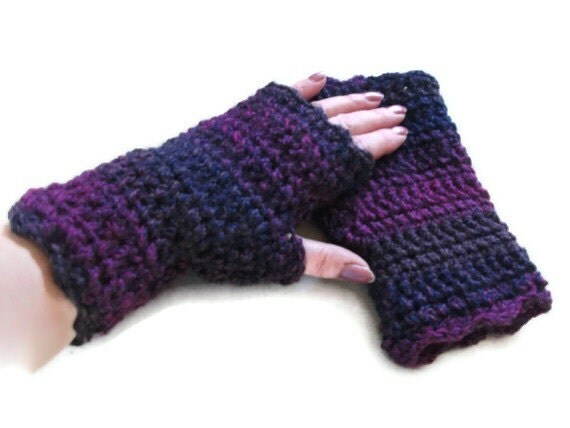 These wonderful fingerless mittens, wristwarmers or wristies, are crocheted in a chunky marble acrylic in shades of Purple, Plum and Navy Blue too. They are made long enough to keep wrists nice and warm too. These are crocheted in a stitch of my own devising that gives them a lovely pattern and texture. The top and wrist have a scalloped edge for extra decoration. The pattern makes them stretchy so they fit nicely whatever the size. They are soft and warm and the colouring makes them outstanding. Folksy :: Buy "Crocheted Fingerless Gloves/Wristwarmers"
Folksy :: Buy "Hat - Purple with Flower Brooch." Slate Grey Crocheted Long Length Fingerless Mittens or Wrist Warmers.